This dramatic infrared image shows the nearby star formation region Monoceros R2, located some 2,700 light-years away in the constellation of Monoceros (the Unicorn). The picture was created from exposures taken by the VISTA survey telescope at ESO's Paranal Observatory. Anextraordinary starscape of glowing gas, dark clouds and young stars within theUnicorn constellation ? ?has been captured by astronomers using the telescopesat the European Southern Observatory. Whenobserved from Earth, the Unicorn constellation appears close to the morefamiliar Orionnebula, but the location ofthe constellation is actually almost twice as far away, at a distance of about2,700 light-years. In visiblelight, a grouping of massive hot stars creates a beautiful collection of reflectionnebulas ? so called because the clouds ofgas and dust reflect light from nearby bright stars. In this new image, theblue starlight is scattered from parts of the dark, foggy outer layers of themolecular cloud. Most of themassive newborn stars, however, remain hidden behind the thick interstellardust that strongly absorbs their ultraviolet and visible light. In fact, thestar-forming Monoceros R2 region is almost completely obscured by interstellardust when viewed in visible light. TheMonoceros R2 cluster has a dense core which is packed with very massive youngstars. Other bright infrared sources are also visible, which are typicallynewborn massive stars still surrounded by dusty disks. Thespectacular new infrared image was taken by ESO's Visible and Infrared SurveyTelescope for Astronomy (VISTA) at the ParanalObservatory in northernChile. The region lies at the center of the image, where a much higherconcentration of stars is visible on close inspection, and where the prominentreddish features probably indicate molecular hydrogen emissions. The infraredtelescope is capable of penetrating the region's dark curtain of cosmic dust toreveal the folds, loops and filaments that have been sculpted from theinterstellar matter. These glowing tendrils of gas were shaped by intense particlewinds and the radiation emitted by hot, young stars. "When Ifirst saw this image I just said 'Wow!'" said Jim Emerson, a professor ofAstrophysics at Queen Mary, University of London, and leader of the18-university VISTA consortium in the United Kingdom. 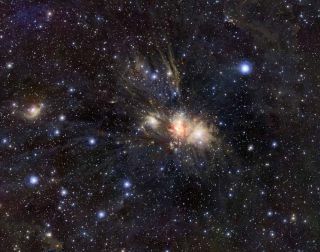 "I wasamazed to see all the dust streamers so clearly around the Monoceros R2cluster, as well as the jets from highly embedded young stellar objects,"Emerson said. "There is such a great wealth of exciting detail revealed inthese VISTA images." The mostmassive of these stars are less than 10 million years old. Stars formin a process that typically lasts a few million years and which takes placeinside large clouds of interstellar gas and dust hundreds of light-yearsacross. Because the interstellar dust is opaque to visible light, infrared andradio observations are crucial in the understanding of the earlieststages of the stellar evolution. The ESOimage was created from exposures taken in three different parts of thenear-infrared spectrum.